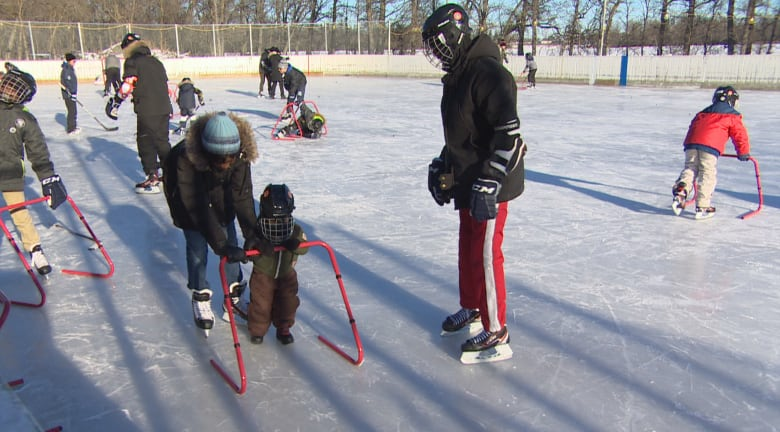 Under an icy-blue January sky, dozens of new Canadians bundled up and tried skating for the first time Saturday at Camp Manitou in Headingley, Man. 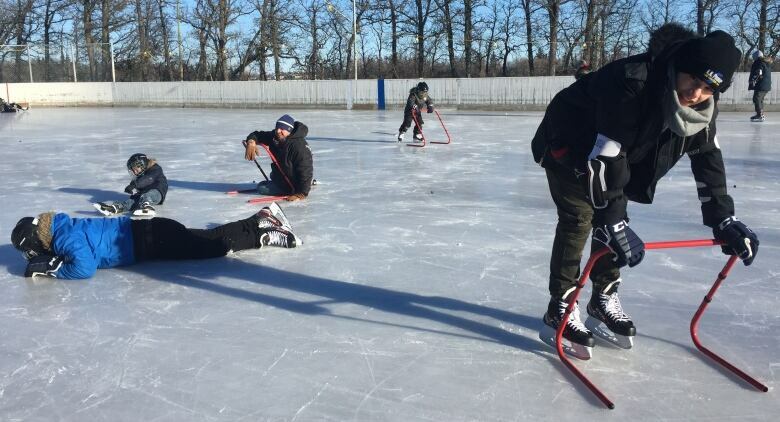 The outdoor event was organized by True North Youth Foundation as a way to both expose newcomers to Canadian winter pastimes and win over some new Jets fans. "Basically the idea is to introduce them to the sport of hockey," said Rick Bochinski, director of Camp Manitou and head of outreach for the Winnipeg Jets Hockey Academy. CBC was a media sponsor for the event. Despite temperatures plunging past –20 C, Bochinski said the two groups of new Canadians — one from the Seven Oaks area and the other from Winnipeg's downtown core — arrived dressed warm and ready for arctic-like weather. "Today we're fortunate that there's actually not a lot of wind," said Bochinski. "I know some of them are probably like, 'This is crazy why are we outside right now?'" Along with skating, newcomers were able to try out snowshoeing, cross-country skiing and tobogganing at the camp. Mercy Aje and her family immigrated to Canada six months ago from Nigeria. Saturday was her first time on skates. Bent over a red skate trainer, Aje slowly and carefully made her way around the rink, one micro movement at a time. "It's fun, I like it," she said. "How I wish I could do it like the other guys who are just flying." Her school-age children, seven-year-old Olanrewaju and nine-year-old Ololade, skated once before and on Saturday were zooming around without much help. "You know kids they learn fast," Aje said. Minutes after her son took a small tumble, her daughter, Ololade, said proudly she has fallen only once. On Saturday she skated around the rink with a hockey stick in hand. Her advice for others learning how to skate is foster a bit of self confidence. "If you think you can't do it, just do it as if you have done it," Ololade said. All the participants at Saturday's learn to skate camp receive tickets to a Winnipeg Jets game and a gift card to purchase Jets merchandise from True North.